A quick view of the most influential metrics in East Meadow. East Meadow is a medium-sized hamlet and CDP and unincorporated area in the town of Hempstead in Nassau County, New York. It is located approximately 30 miles from Manhattan, has six neighborhoods and is the 27th largest community in the state. The community is family-friendly and features good schools, low crime rates, traditional single family homes and high rates of homeownership which combine to make it a very stable and comfortable community. It is a well-educated community, where nearly 36% of all adults have four-year degrees or more, which is well over the national educational average. It is quite ethnically and racially diverse. Common ancestries include European, Asian and Hispanic and over 18% of all residents are foreign born. English is the primary language, followed by Spanish and Urdu. The land that would one day become East Meadow was surveyed in 1665 by a pair of surveyors for Hempstead Town. The land was deemed suitable or grazing livestock and was popular as such for many years. During the American Revolution, it was occupied by the British. In its early years two of the most influential farms as the Barnum Farm and the Carman Farm. At the intersection of what is now Prospect Avenue and East Meadow Avenue a settlement grew and was home to several sizable states like the Barnum Estate and the Brookholt estate. Over the years it has been home to many notable residents, like illusionist Criss Angel, biologist/bio-engineer Donald E. Ingber, actress Jenna Ushkowitz, mixed martial artist Matt Serra and many more. Today the thriving community is home to three golf courses, green spaces and the Nassau University Medical Center. 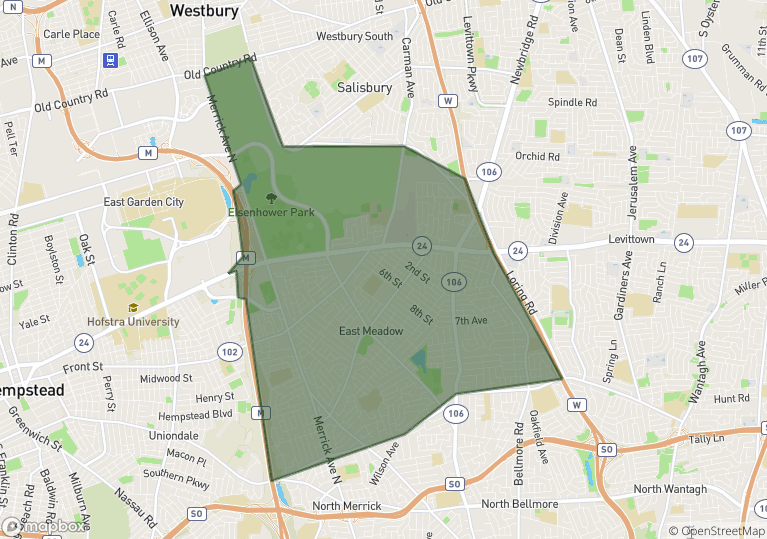 East Meadow spans 6.3 square miles of land area. It is an upper-middle income community compared to state economic statistics and wealthy on compared to state economic statistics. In 2010, the population was 38,132 and the population density was 6,100 people per square mile. In the same year, the median household income was $67,185, the median family income was $74,691 and the per capita income was $27,076. By 2015, the estimated median household income was $96,454 and the estimated per capita income was $38,365. In the same year, the median house or condo value was $398,78, the mean price on all housing units was $572,425 and the median gross rent was $1,994. It is a thriving white-collar community, where over 87% of the workforce hold white-collar positions. Major companies in East Meadow include Getty Oil, Lufthansa, Swiss International Airlines. The average daily commute for residents of East Meadow is approximately 31/32 minutes. Driving privately owned vehicles is a popular solution, however, public transportation is available and many residents rely on commuter trains for their daily commutes. Pubic education is primarily provided by the East Meadow Union Free School District. Schools in the community include Barnum Woods School, Parkway School, Woodland Middle School, East Meadow High School and others. Homes for sale in East Meadow are predominantly traditional single family structures. Other real estate options include rental properties like apartments as well as townhomes a condominiums for lease or sale. To begin your home search in beautiful East Meadow, call friendly local real estate agent Ed McNulty today at 516-887-3603. View our selection of available properties in the East Meadow area. Check out the latest demographic information available for East Meadow. Learn more about schools near East Meadow complete with ratings and contact information. Browse through the top rated businesses in the most popular categories East Meadow has to offer.